How and Where to Buy Dexilant Online? You can buy Dexilant online through CanadianPharmacyWorld.com at huge savings. We do require a valid prescription from your doctor. Our Canadian Pharmacy carries brand and generic medications from Canada as well as other international pharmacies. For more information about us, please call us at 1866-485-7979. Are there Alternative Names for the Brand and Generic Dexilant? The brand Dexilant comes from Canada and is manufactured by Takeda. There is no generic available for this medication. What Dosages and Forms is Dexilant available in? Dexilant is available in the strength of 30mg and 60mg capsules only. 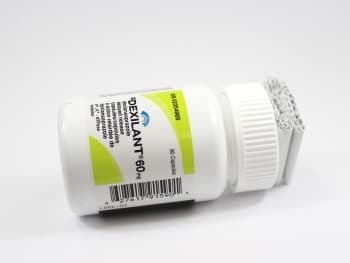 Dexilant is a prescription medication that is used to treat certain stomach and esophagus problems. It is also used to treat GERD. The Dexilant pill has two medications in one pill. The first medication releases within one hour of taking it and the second medication releases four to five hours later. Dexlansoprazole belongs to a class of drugs known as proton pump inhibitors (PPIs). It works by reducing the amount of acid made by the stomach. Are there any Precautions or Drug Interactions for Dexilant? You should not take Dexilant if you are allergic to Dexlansoprazole. Before you start taking this medication, talk to your doctor about your medical history and about all the medications you take including OTC and herbal medications. Dexilant should not be used during pregnancy. It is unknown if this medication passes into breast milk or how it affects a nursing infant. Talk to your doctor before breast-feeding a baby. There may be an interaction between Dexlansoprazole and other medications such as clopidogrel, digoxin, ampicillin, itraconazole, ketoconazole, mesalamine, methotrexate, tacrolimus, warfarin, etc. Dexilant should be stored at room temperature away from light and moisture and out of reach of children and pets. This medication should not be stored in the bathroom.